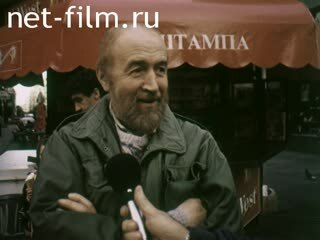 Script writers: Troshkin V. P.
Operators: Maev A., Myakishev G.
The film tells about the events in Yugoslavia in 1999. A film about the events in Yugoslavia in the spring and summer of 1999. City of Belgrade. Residents Belgrade are interviewed (synchronously). Destroyed buildings. Residents dismantle destroyed buildings stand in a queue for the newspapers. Destroyed building telecentre. Doctors and hospital patients. People affected by the bombing. Fires. Explosions. Residents of the city dismantled debris. Killed in the streets. Rally at the U.S. Embassy. Demonstration. Cost crew: cameraman RCSDF G. MYAKISHEV, V. Maev, sound Yu Ogandzhanov - MS.
Yugoslavia: The drive to the village - MS.
Man collects hay forks - MS., PNRM. 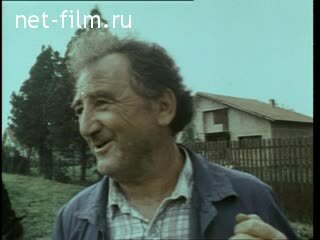 Yugoslavian farmer says (synchronously) - CU. Maev operator of the peasants - MS.
Man leads a cow - MS., PNRM. Woman with child - CU. PNRM. the house - MS. The man says (synchronously) - MS.
PNRM. Street of the city - MS.
Street of the city - MS., LS., PNRM. PNRM. a man on a woman - CU. Belgrade Street - LS., PNRM. Says military (synchronous) - CU. PNRM. a man on a woman - MS.
A young man reads a newspaper - MS.
Belgrade Street - LS., MS., PNRM. A man unloads paper - MS., PNRM. Of all the papers - MS., PNRM. People make the destroyed buildings - LS., PNRM. Destroyed building telecentre - MS. Destroyed building telecentre - LS. PNRM. from the building to the operators - MS. Flag with a red cross - MS. The doctor says (synchronously) - MS. The door opens and out nurse - MS. Lies another woman - MS.
Nurse with a dropper - MS.
Said the teacher (synchronously) - MS.
Woman says (synchronously) - MS.
Said operator (synchronous) - MS.
PNRM. The deserted streets of the city - LS., MS. Firefighters extinguish a building - LS., MS.
People pulled his body from the rubble - MS.
Plates with the NDP in a foreign language - MS. Lies bomb - LS., MS.
PNRM. with men in the fragment of shell - MS. Destroyed bridge - LS., MS., PNRM. Rally at the embassy - MS., PNRM. Go demonstrators - LS., PNRM. A man throws a plate - MS.
Men throw stones - MS.
Demonstrators stand - MS., PNRM. People knock emblem on the U.S. Embassy - MS.
People trample sign - MS.
PNRM. by slogans - MS.
Are the protesters - MS.
People go with candles and flowers - MS.